Let’s be honest: us mamas will do just about anything to get our kids to sleep well. My four-year-old has been climbing into my bed this last week, sandwiching me between him and the two-year-old. It’s not my idea of a good time and it makes me desperate to get him sleeping better. Which is why I created this magnesium lotion recipe. I’ve tried various recipes, but I wanted one that soaked into my skin better. I based this one on my favorite simple lotion recipe, so I knew I would like it, and I added a soothing essential oil blend to help induce sleepy time. The reason I wanted to create a magnesium lotion recipe is because magnesium is well absorbed through the skin. There are lots of different types of magnesium, which I’ll look at closer below, but first, let’s take a look at why we should supplement magnesium in the first place. Magnesium is needed for essentially every function in the body. You can’t live without it. Magnesium can help keep you regular. It relaxes the gastrointestinal tract and keeps peristalsis, the natural muscle relaxation and contraction of the colon, working properly. Too much of the wrong kind can cause a problem of a different kind, so stay tuned. Magnesium eases muscle cramps. Muscle cramps are often caused by lack of magnesium and other minerals, so supplementing with this magnesium lotion recipe can relieve them. Magnesium calms the nervous system and eases anxiety. Magnesium is a relaxant, which can soothe the nervous system and relieve symptoms of anxiety, depression, nervousness, and irritability. Magnesium helps increase energy. While magnesium helps with relaxation, it’s needed on a cellular level to increase energy. Read about the right kind of magnesium to take for energy here. Basically, magnesium is really stinkin’ important! There are basically three ways I use magnesium in order to supplement. Epsom salt baths- I take hot Epsom salt baths nearly every day in order to soak in some magnesium and help my body detox through the skin. Wake Up Maggie- a new powdered magnesium supplement from my favorite supplement company, Corganic, Wake Up Maggie is a combination of three types of quality sources of magnesium, along with boron for better absorption. This magnesium is formulated to create energy on a cellular level. Mr. Incredible took it with him on a recent trip out of town for a big interview and totally nailed it. He got the promotion and now we’re moving. I’m not saying it was all due to Wake Up Maggie… but I’m not saying it’s not either. Grab Wake Up Maggie here. 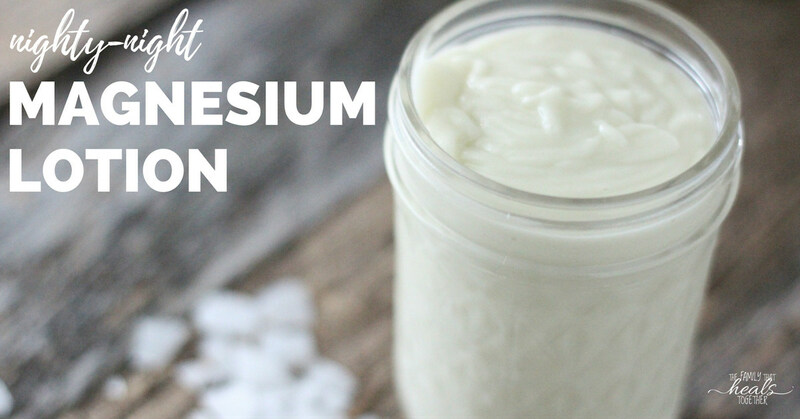 My homemade magnesium lotion- I try to make sure and rub down with this lotion every night before bed. Knowing how important magnesium is, I wanted an easy way to get it into my kiddos. 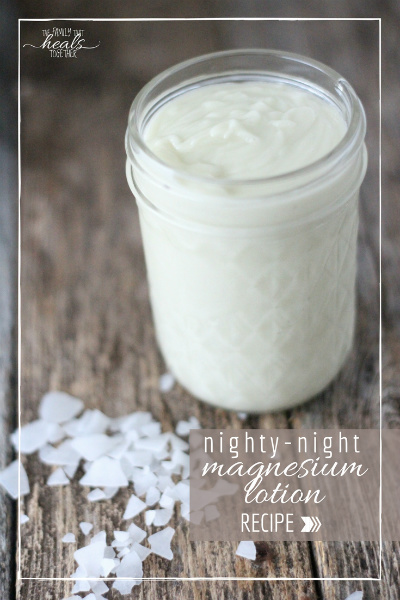 This Nighty-Night Magnesium Lotion recipe makes it easy to supplement magnesium for my kids, plus helps everyone sleep better. End game: mom win. This lotion stings a little at first. However, in my experience, the stinging stops after a few days of use, as your levels of magnesium improve and your body adjusts. If your kids complain, you can rub it on the soles of their feet, where it doesn’t get itchy. Otherwise, I rub it on soft tissue like thighs and tummy. This lotion doesn’t taste good. Tidbit from Mister Two, who thought he’d lick the pan after I was done making it. Bad move, sir. With all that in mind, go give this super simple and easy magnesium lotion a try and have everyone sleeping better TONIGHT! Dissolve the magnesium chloride flakes in the hot water. Meanwhile, warm the avocado oil and emulsifying wax over low heat in a small saucepan. Once the magnesium flakes are dissolved and the emulsifying wax is melted and combined with the avocado oil, add the water/magnesium mixture to the oil and give it a whisk. Add the Nighty-Night essential oil blend and whisk once more. Store in an air-tight container and rub on 1/4-1/2 tsp. at a time before bedtime. Hello, thanks for posting this lotion. I know I need more magnesium in me! However, if I want to leave out the essential oil, should I increase the avocado oil? Or is it ok to just skip? Fun fact: although lavender=sleep is engraved on everyone’s brain, especially in the natural/home remedy community, that is not actually always true! Any time I use lavender eo near bedtime, I experience vivid, restless dreaming. So techincally, I am asleep, but it’s not peaceful! So at my house, lavender is for bug bites, the end. This sounds like something I would like to try. Do you think I could use sweet almond oil instead of the avocado oil? I made this last night followed the recipe to the T and it set up on top but there’s like fine line that it didn’t set up on the bottom ? Please advice me on what I need to do! Hi Amy, I’m not sure what happened, but I would suggest rewarming it and mixing as it cools. I noticed on the Wake Up Maggie website, that they also have a product called Good Night Maggie. Do you recommend this as well? What are your thoughts on it?